It is written that we shall “stand before” Him, shall appear, shall be inspected. The promise of glory is the promise, almost incredible and only possible by the work of Christ, that some of us, that any of us who really chooses, shall actually survive that examination, shall find approval, shall please God. To please God...to be a real ingredient in the divine happiness...to be loved by God, not merely pitied, but delighted in as an artist delights in his work or a father in a son—it seems impossible, a weight or burden of glory which our thoughts can hardly sustain. But so it is. C.S. 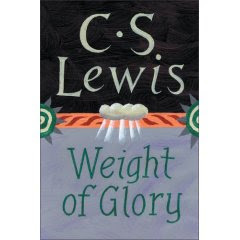 Lewis, "The Weight of Glory"
We are on the eve of commemoration of the one day in his ministry when Jesus accepted the perquisites of earthly glory, when he became "the King of Glory" entering Jerusalem on a colt's back, when the shouts of Hosanna rang from the peoples' lips--and perhaps from the stones in the road. Our hymn echoes their cry: "All Glory, Laud and Honor to Thee, Redeemer King!" Peter later recalls that "We beheld his Glory", glory as of the only-begotten Son of the Father, full of grace and truth. He bore that weight of glory rather lightly, and usually out of plain view. He won eternal glory by bearing the burden of sin to the cross and beyond. Mere mortals carry that weight rather less well. Any gifted artist, athlete, academic, aviator, or even astronaut returns rather swiftly to earth after being heaped with praise. Our leaders, elected or in waiting, do not run the political gauntlet without suffering the occasional fall from grace--and some seem to leap into it recklessly. It presents a daunting task for us whose aspirations are modest. It is no task in fact that we can execute without mountains of grace. I shrink from the weight of glory. It is too much for me. But because it was not too much for him, I have a hope of attaining ultimate glory such as I cannot even imagine.